Whether you're new to the world of traveling or you're a seasoned pro, these budget travel tips will help you save BIG on your next trip. I'm sharing my best low cost travel tips, how to get cheap flights, where to travel on a budget, and so much more! It's a long post, but it's one that could change the way you travel. 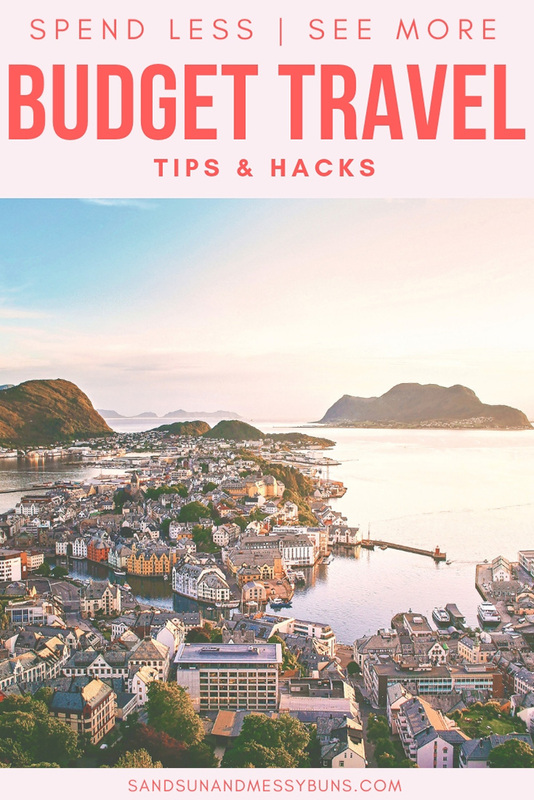 If you find these budget travel tips helpful, please share this image on Pinterest! Thank you! Flights and accommodations almost always eat up the largest chunk of the travel budget, so let's start off with the best ways to save money on airfare. Here are a few steps you can take to begin saving money before you even know where you're headed. Bookmark the deals page for your favorite airline companies and check them frequently. For example, I'm a Delta girl, so I check this page weekly. Consider signing up for a travel rewards credit card to earn miles or points that you can apply towards trips. It's the #1 method I use to fly for free (or at a discount). First, I check the Delta Deals page weekly to look for deals on quick getaways. Step 2 is to find the best miles offers. For example, today I found a deal from ATL to RIC that would allow me to see the fall color in Virginia for only 11,000 miles round trip! The final step is to cash in some of the miles I've collected from using my Delta AMEX credit card to book a last-minute trip. That's ok. Some of the best trips are spontaneous. Try these methods to score cheap flights when you have a flexible itinerary. Consider departing out of a nearby city where friends or family live. 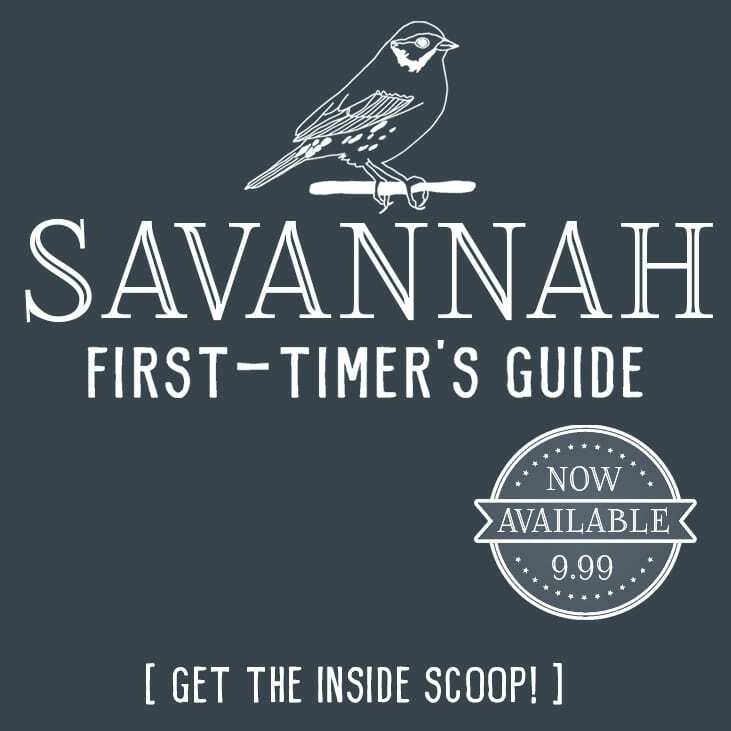 For example, I live in Savannah, where flights are fairly expensive, but I often find cheaper options by flying out of nearby Columbia, S.C., where my parents live. I leave my car at their house during my travels and have a family member drop me at the airport so I don't have to rack up expensive parking fees. Follow airline social media accounts or sign up for their newsletters to keep an eye out for last-minute deals and mistake fares. If you spot a fare mistake, you'll know immediately because it will seem too good to be true. Be ready to act on it immediately! TravelPirates is a fun site for incredible last-minute deals all over the world. I'm in a few travel blogger groups, and it's the one that's mentioned most often. If you plan to travel internationally and aren't sure where you want to go, try checking currency values in a few countries of interest. If the U.S. dollar is strong and say, the rupiah is weak, then it might be the perfect time to plan a trip to Indonesia. Your money will stretch a lot further when the exchange rates are on your side! 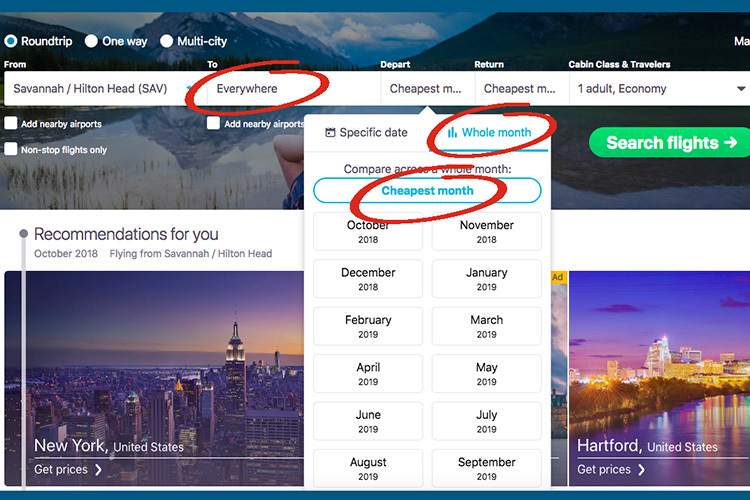 Go to skyscanner.com and use the “cheapest month” option to discover the cheapest flights from your area to anywhere! Try it! It's fun! 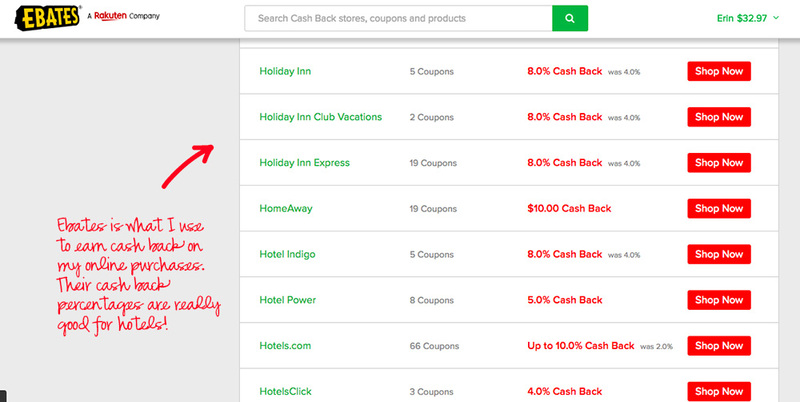 Just look at those cash back rates on hotels! 8 to 10% cash back on a hotel purchases! lol It's seriously the easy way to earn money and that's probably why they have 10 MILLION users. If you aren't already using it, you can sign up here and get a $10 bonus the first time you spend $25! That's a good thing! You can focus with laser-like intensity on the area and set alerts to increase your chance of scoring a good deal. Book in advance! 2-3 months in advance is ideal for domestic flights. Begin searching even further ahead if you're traveling overseas. You probably already know it's beneficial to vacation in the off-season, but have you heard of “shoulder season“? It's the time between peak travel dates and the off season. You can score some pretty good deals by looking in that time frame! 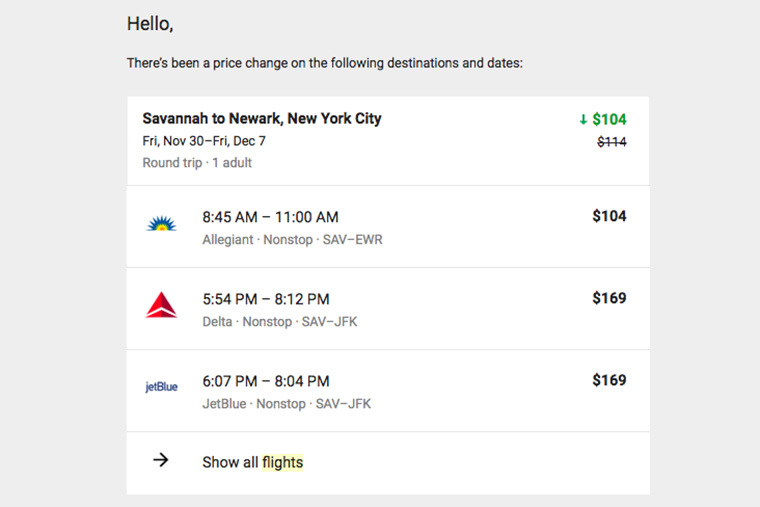 Set an alert with the apps above — or with Google Flights — to monitor for rate drops. Tuesday, Wednesday, and Saturday are usually the cheapest days to fly. Be an early bird! Flights beginning around 5 or 6 a.m. are usually the least expensive. Be flexible with your itinerary. Flying one day earlier or later than planned can often net hundreds of dollars in savings! Ask the airline if it's cheaper to purchase tickets in person. For example, Spirit Airlines charges a “Passenger Usage Charge” (you'll find it hidden on your ticket under the “taxes” section). It's currently $39.98 per round trip flight. However, if you go to the airport and purchase your ticket in person instead of buying online, you won't have to pay that fee. Always be on the lookout for unique ways to earn airline miles. It's easiest if you're a frequent flyer with a specific airline so you only have one program to stay on top of at all times. 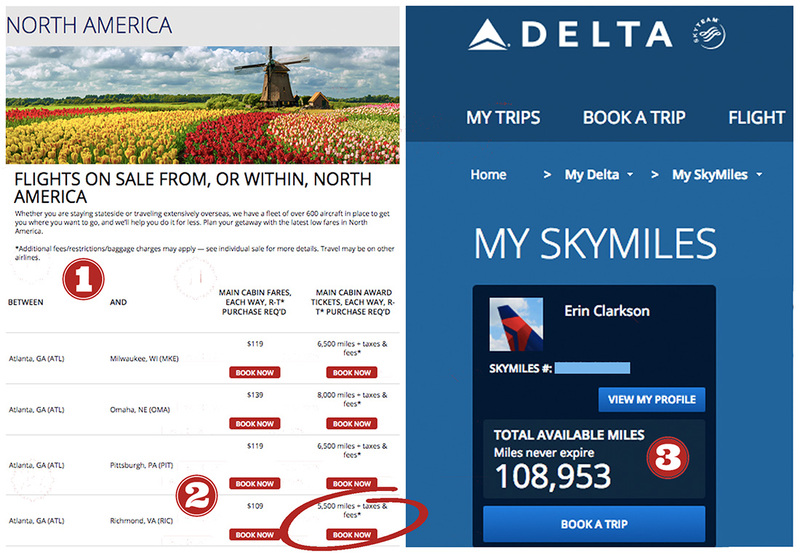 As mentioned, I'm a Delta girl, so I'm always on the lookout for multiple ways to earn SkyMiles. For example, did you know you can earn SkyMiles anytime you book a home through Airbnb? Here's the Delta + Airbnb partnership info. Go Incognito! Clear your browser's cache before searching for flights. Sneaky websites and frequent flier programs have been known to increase their prices if they notice you're obsessively checking rates or otherwise exhibiting behavior that indicates a purchase is imminent. Check your final destination airport to see which budget airlines fly into it. Sometimes the budget fares don't show up on aggregate sites, so you might be able to score a cheaper flight by checking the budget airlines directly. Once you've narrowed down the best fare using the price aggregator sites, write down the flight number and pertinent details, and then book directly through the airline's website. Airlines give preferential treatment to their own customers, so it's less likely you'll be bumped by booking direct. You'll also have an easier time if your flight is cancelled or delayed. If you aren't already a member of the airline's frequent flier program, make sure you join BEFORE your flight. Enter your frequent flier number before or during the check-in process to ensure you earn credit. Pack light! Airlines tack on fees any way they can, and baggage fees are a big one. The best way to travel is with a carry-on only. Bring your own snacks. The markup fees on a bag of chips at the airport are insanely high. Why pay $4 for a bag of Cheez-Its when you can prefill a ziplock bag with ones purchased from the grocery store (at $2 for a family-sized box, no less)? You can't take water through security, but you can carry an empty water bottle and fill it from the fountain once you make it to your gate! It beats buying a $4 bottle of water when you're on a tight budget. Check with the hotel at your arrival destination to see if they offer an airport shuttle. You often only need to place a call directly to the hotel and they'll send a car to pick you up. Stay with Friends – Obviously the best — and cheapest — place to stay while traveling is with friends or family members. If you open up your home to friends when they're traveling, chances are good they'll return the favor and let you stay with them. Always treat their home better than you would your own! It's nice to take them to dinner or do something special as a thank you. Couchsurfing – Couchsurfing consists of a unique network of travelers who open up their homes so like-minded wanderlusters can enjoy their city for a day or two. This is easily one of the cheapest accommodation options available today (it's free), but don't expect much in the way of privacy since you'll have to crash on someone's couch. As far as safety is concerned, make sure you check references and reviews. Hostels – If you don't mind sharing a room with strangers, a hostel is often the way to go! Hostelworld is probably the most well-known option. Housesitting – Try trustedhousesitters.com to find long(ish)-term options for staying in someone's home. This post is getting really long, but I could (obviously) share my favorite travel hacks for days on end. Here are a few more ways to save on hotels. Sign up for hotel loyalty programs, which are similar to frequent flyer clubs, then collect hotel points that can be redeemed for free overnight stays. For example, here are the member benefits you'll receive via the Hilton Honors program, which is one of my favorites. Always call a hotel prior to booking to see if they'll match rates discovered via a discount site. They often will to avoid paying a commission to the site. Check hotel websites directly to see if they have a “specials” page that includes coupons or early booking discounts. Be on the lookout for price-matching and best rate guarantees. For example, with the hotels.com “Best Rate Guarantee“, they'll refund the difference if you find a lower rate prior to your stay. Request upgrades!! Hotels are usually pretty accommodating (ha! ), and it never hurts to ask for what you want. For example: tell the manager you're trying to decide between theirs and another hotel, but the other hotel offers free wi-fi to guests and theirs doesn't, then ask if they'll provide complimentary wi-fi during your stay. What are your favorite budget travel tips? Comment below if you have one we should all know about, and I'll add it to the list.